Revelation 14:1 pictures a special group of people standing with Jesus on Mount Zion. “And I looked, and, lo, a Lamb stood on mount Sion, and with Him an hundred forty and four thousand, having His Father’s name written in their foreheads. “In this study, with God’s help, we shall identify this group more clearly. God’s will for mankind is that all be saved. “For this is good and acceptable in the sight of God our Saviour; who will have all men to be saved, and to come unto the knowledge of the truth.” 1 Timothy 2:3,4. “And all flesh shall see the salvation of God.” Luke 3:6. Despite the fact that it is God’s will that all be saved, He will never force salvation on anyone. “Then said one unto Him, Lord, are there few that be saved? And He said unto them, Strive to enter in at the strait gate: for many, I say unto you, will seek to enter in, and shall not be able.” Luke 13:23, 24. “For many are called, but few are chosen.” Matthew 22:14. It is not that God arbitrarily chooses only a few, but because man is not willing to be saved in God’s appointed way, many will be lost. Often, on a spur of the moment or under emotional experiences, people profess to accept Christ; but they just as often turn right back into a life of sin again. 1 Kings 18:39 relates the Israelite people’s reaction to the fire of God in the days of Elijah: “And when all the people saw it, they fell on their faces: and they said, The Lord, He is the God; The Lord, He is the God.” Yet just a few days later they had slipped back so far into their old ways that the prophet of God, Elijah, felt he was entirely alone. “And he came thither into a cave, and lodged there; and, behold, the word of the Lord came to him, and He said unto him, What doest thou here, Elijah? And he said, I have been very jealous for the Lord God of hosts; for the children of Israel have forsaken Thy covenant, thrown down Thine altars, and slain Thy prophets and with the sword; and I, even I only, am left; and they seek my life to take it away.” 1 Kings 19:9, 10. This was in B.C. 906. In B.C. 599, there was a similar situation; Israel was scattered by false pastors, and a remnant was to be gathered. “Woe be unto the pastors that destroy and scatter the sheep of My pasture! Saith the Lord. Therefore thus saith the Lord God of Israel against the pastors that feed My people; Ye have scattered My flock, and driven them away, and have not visited them: behold, I will visit upon you the evil of your doings, saith the Lord. And I will gather the remnant of My flock out of all countries whither I have driven them, and will bring them again to their folds; and they shall be fruitful and increase.” Jeremiah 23:1-3. Again in B.C. 594, God’s professed people Israel turned away and were to be destroyed by God, with only a remnant left. See Ezekiel 6:1-4, 8, 9. A remnant of God’s people was re-established in B.C. 457. See Ezra 9:8. When Christ Himself came down from heaven to Israel, which had been His chosen people, very few accepted Him. Several years later, the apostle Paul spoke of the few who accepted Christ as their Saviour. “I say then, Hath God cast away His people? God forbid. For I also am an Israelite, of the seed of Abraham, of the tribe of Benjamin. God hath not cast away His people which He foreknew. Wot ye not what the scripture saith of Elias? How he maketh intercession to God against Israel, saying, Lord, they have killed Thy prophets, and digged down Thine altars; and I am left alone, and they seek my life. But what saith the answer of God unto him? I have reserved to Myself seven thousand men, who have not bowed the knew to the image of Baal. Even so then at this present time also there is a remnant according to the election of grace.” Romans 11:1-5. So it has been throughout the ages. And so it will be in the last days of earth’s history! God will have a small remnant left over. This last-day remnant is pictured in several Scripture texts in the book of Revelation. “Here is the patience of the saints: here are they that keep the commandments of God, and the faith of Jesus.” “And the dragon was wroth with the woman, and went to make war with the remnant of her seed, which keep the commandments of God, and have the testimony of Jesus Christ.” “And I fell at his feet to worship him. And he said unto me, See thou do it not: I am thy fellowservant, and of thy brethren that have the testimony of Jesus: worship God: for the testimony of Jesus is the spirit of prophecy.” Revelation 14:12; 12:17; 19:10. This special class of people has three characteristics: (1) They patiently wait for the Lord’s return, despite oppression; (2) they keep God’s Ten Commandments; and (3) they have the spirit of Prophecy as a special gift. The last of God’s remnant people are a special class, because they live in a special time – a time of great deception and persecution. “But evil men and seducers shall wax worse and worse, deceiving, and being deceived.” 2 Timothy 3:13. “For there shall arise signs and wonders; insomuch that, if it were possible, they shall deceive the very elect.” Matthew 24:24. See also Luke 18:1, 7, 8. It is under these forbidding circumstances that God’s people must live in the days just prior to Christ”s coming. Today, in a time of increased wickedness, God is doing an important work. “And after these things I saw four angels standing on the four corners of the earth, holding the four winds of the earth, that the wind should not blow on the earth, nor on the sea, nor on any tree.” Revelation 7:1. We have already learned the prophetic meaning of wind – strife and bloodshed. Right now the angels of God are restraining the nations from using their mammoth arsenals of deadly weapons and are preventing nuclear holocaust for a special reason. “And I saw another angel ascending from the east, having the seal of the living God: and he cried with a loud voice to the four angels, to whom it was given to hurt the earth and the sea, saying, Hurt not the earth, neither the sea, nor the trees, till we have sealed the servants of our God in their foreheads.” Revelation 7:2,3. 1. His name is Lord. So the lines are drawn. The ones who receive the seal of God are those who worship the Creator by honouring the day He set aside as a memorial of His created works. Those who worship the counterfeit sabbath of Rome, that symbol of idolatrous sun worship, Sunday, will receive the mark of the beast. This is why the remnant are described as those who keep the commandments of God. God even knows how many will receive His seal. 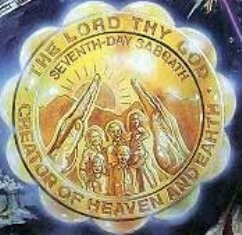 “And I heard the number of them which were sealed: and there were sealed an hundred and forty and four thousand of all the tribes of the children of Israel.” Revelation 7:4. When it speaks of Israel here, it does not mean only literal Israelites, for as we examine who composes Israel, it is clear that it includes all who have the character of Israel – all who have overcome their sins. See Romans 11:17; 10:12. “Not as though the word of God hath taken none effect. For they are not all Israel, which are of Israel: Neither, because they are the seed of Abraham, are they all children: but, in Isaac shall thy seed be called. That is, They which are the children of the flesh, these are not the children of God: but the children of the promise are counted for the seed.” Romans 9:6-8. These overcomers are the ones who are shown standing on Mount Zion. The message of God’s true rest day, the Sabbath, although almost lost during the Middle Ages, has been proclaimed loudly since about the year 1848 by the Advent people. Through this message God is sealing His people. A special blessing is even pronounced on those who have died in Christ, obedient to all His law, during this proclamation. “And I heard a voice from heaven saying unto me, Write, Blessed are the dead which die in the Lord from henceforth: Yea, saith the Spirit, that they may rest from their labours; and their works do follow them.” Revelation 14:13. These individuals have the special privilege of being called forth from their graves in a special early resurrection. See Daniel 12:2. They are called forth, along with those who nailed Christ to the cross, to witness Christ’s coming. See Revelation 1:7. The Scriptures give more description of this special group, the 144,000, who are God’s remnant of the last day. “And they sung as it were a new song before the throne, and before the four beasts, and the elders: and no man could learn that song but the hundred and forty and four thousand, which were redeemed from the earth. These are they which are not defiled with women; for they are virgins. These are they which follow the Lamb withersoever He goeth. These were redeemed from among men, being the first-fruits unto God and to the Lamb. And in their mouth was found no guile: for they are without fault before the throne of God.” Revelation 14:3-5. What do their characteristics mean? 1. They are not defiled with women: They have no connection with the whore (Roman Catholic Church) of Revelation 17:5 or her daughters, the harlots (apostate Protestant churches); they are not defiled by false doctrines. 2. They are virgins: They carry the pure doctrine. 3. They follow the Lamb (Christ) wherever He goes: It is thought that the 144,000 will occupy a special place in eternity, serving Christ in the temple and accompanying Him from world to world. 4. They are redeemed from among men and are first fruits unto God: Being the saints who are alive when Jesus comes, they will be the first to see Him. Why do they sing a new song which no other person can learn? Because the 144,000 endure the severest tests: (1) They will face the wrath of the wicked under the mark of the beast (not being permitted to buy or sell, and having the death sentence pronounced against them). Revelation 13:12, 15-17. (2) They will endure the seven last plagues as the wrath of God (Revelation 15:1) is poured out on the world for accepting the mark of the beast (Sunday). Revelation 14:9, 10. Though living during the seven last plagues, they will be protected and sustained. Isaiah 33:16. (3) They will go through the time of Jacob’s trouble, when probation has closed and Jesus is no longer interceding for man. Jeremiah 30:5-7. “Though God’s people will be surrounded by enemies who are bent upon their destruction, yet the anguish which they suffer is not a dread of persecution for the truth’s sake; they fear that every sin has not been repented of, and that through some fault in themselves they will fail to realize the fulfillment of the Saviour’s promise: I ‘will keep thee from the hour of temptation, which shall come upon all the world.’ Revelation 3:10.” – Ellen G. White, The Great Controversy, pp. 616, 619.
Who will be part of this number? Will you? You can be – by accepting Jesus Christ as your Saviour today. He will endow you with strength to keep his commandments; He will give you the courage to endure persecution; and He will welcome you into His mansions above. “Then shall the King say unto them on His right hand, Come, ye blessed of My Father, inherit the kingdom prepared for you from the foundation of the world.” Matthew 25:34. 1. Will the majority of this world’s inhabitants be saved? 2. What is the number of people seen standing on Mt. Zion? 3. Is it sufficient for a man or woman just to profess to accept Christ? 4. What is the meaning of the word remnant? 5. True or false? When Christ was on earth, many accepted Him as the Messiah. 6. What are God’s people in the last days called? 7. What are the three special characteristics of God’s remnant people? 8. Name some of the conditions prevalent in the last days. 9. How will this remnant be distinguished from those who receive the mark of the beast? 10. What are the three elements contained in the seal of God? 11. Over what question will all people be called to make their decision? 12. Who composes Israel in these last days? 13. Why are the 144,000 considered a special class of people? 14. What special tests will the 144,000 have to endure? 15. Thought question: Am I ready to have God place His seal upon me?